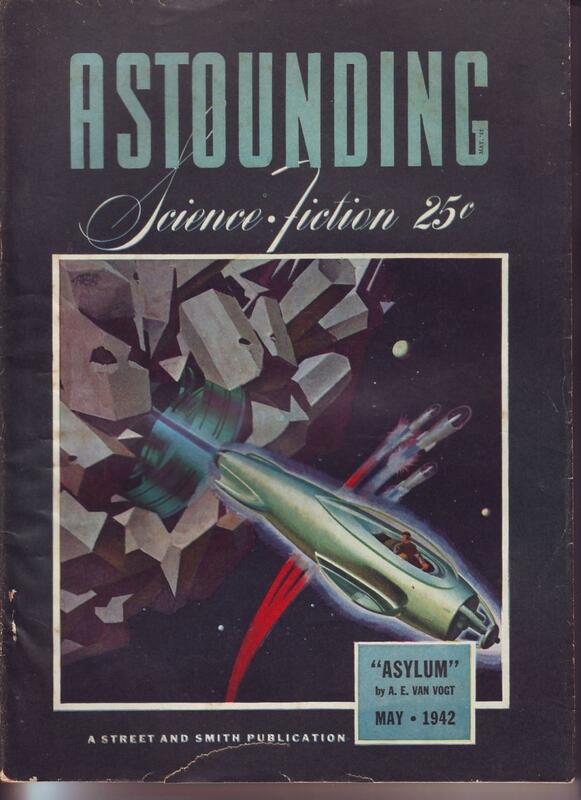 This one, the writers include "Anson MacDonald" with the cover story; Robert Heinlein with "Common Sense"; and Asimov, Sturgeon, and L. Sprague de Camp. I believe this is the last pre-war story that appeared under Heinlein's own name; although we've got quite a few more issues to cover. Here we have another "Lyle Monroe" story; this time "Lost Legion", better known as "Lost Legacy". 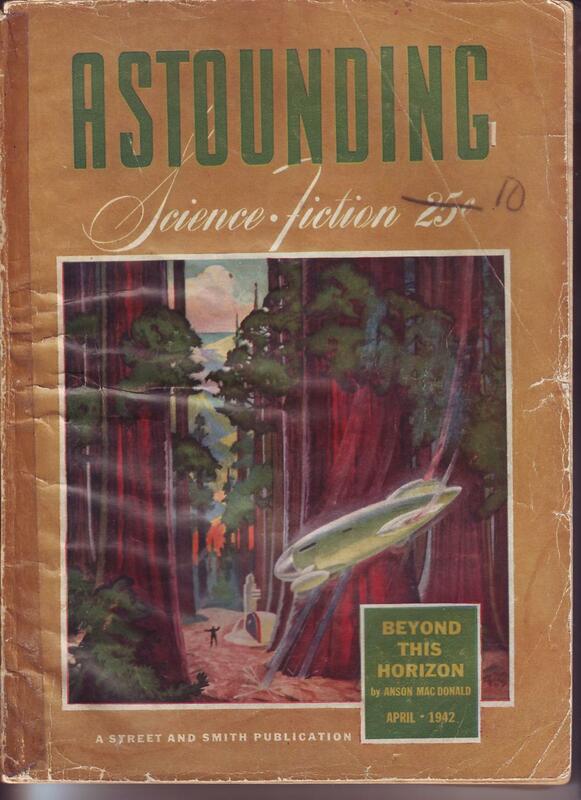 Unlike many of the Lyle Monroe stories, Heinlein had this in a collection under his own name as early as 1953. ISFDB says there was a brief excerpt of the story in the previous issue's "Next Issue" page, but I haven't seen that issue. The other story of note in this one is "Pendulum", which Ray Bradbury wrote with Henry Hasse. It's Bradbury's first professional publication. 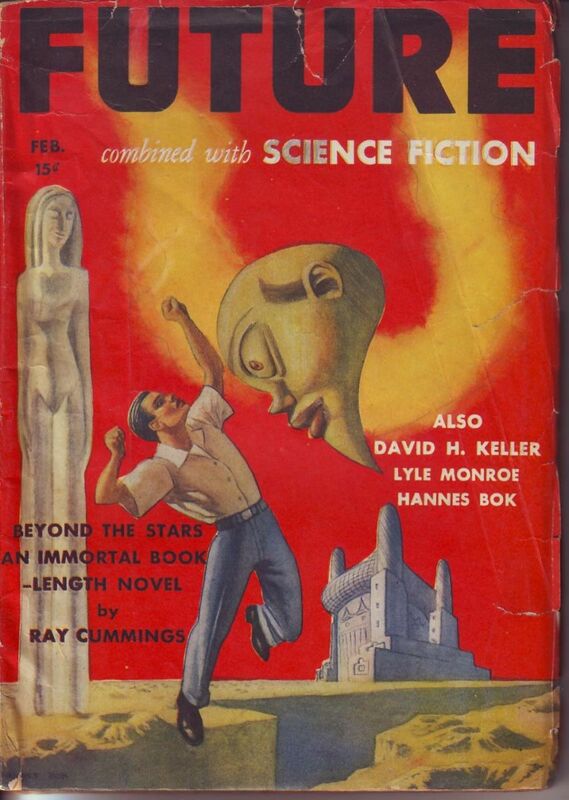 This issue has what is arguably the rarest Heinlein story; "My Object All Sublime" under the "Lyle Monroe" name. It was never reprinted during Heinlein's lifetime; and has only been reprinted twice ever: Once in a book club exclusive, and once in the limited edition of Heinlein's complete works. 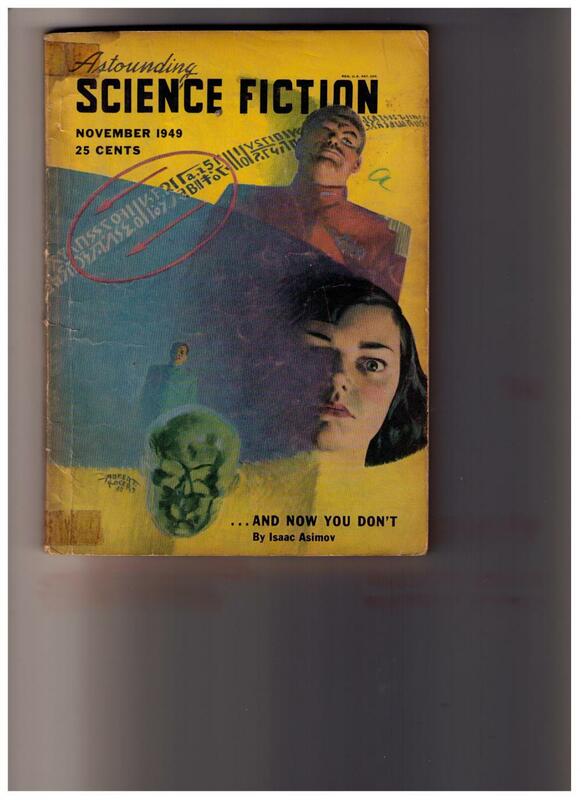 And here's "Lyle Monroe" again with "Pied Piper", the second rarest Heinlein story. It comes in second because, unlike the Future issue, there was a Canadian edition of this issue a couple months later, but otherwise it's only appeared again in the same two collections as "My Object All Sublime". This was the next to last use of the "Lyle Monroe" name; it was used in 1951 on a reprint of "Columbus Was a Dope". 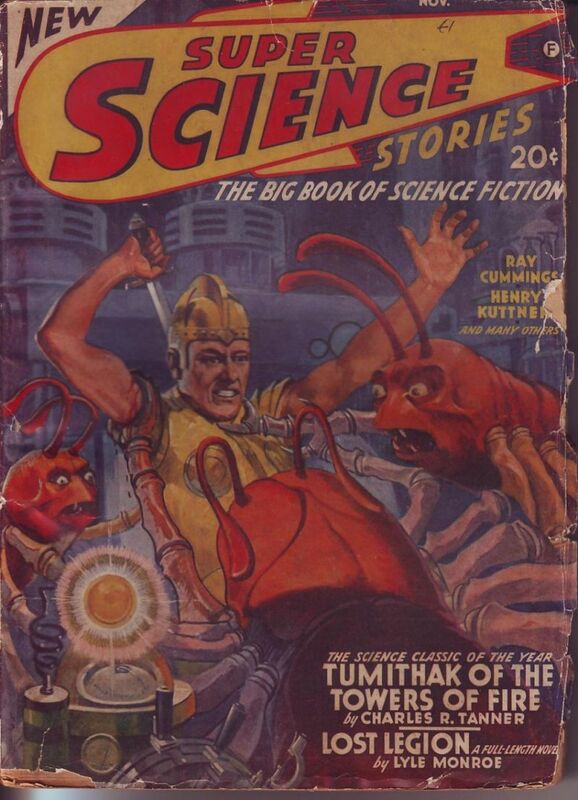 Oddly enough, that story was first published under Heinlein's real name in Startling Stories in 1947; I have no clue why the reprint used the pseudonym. 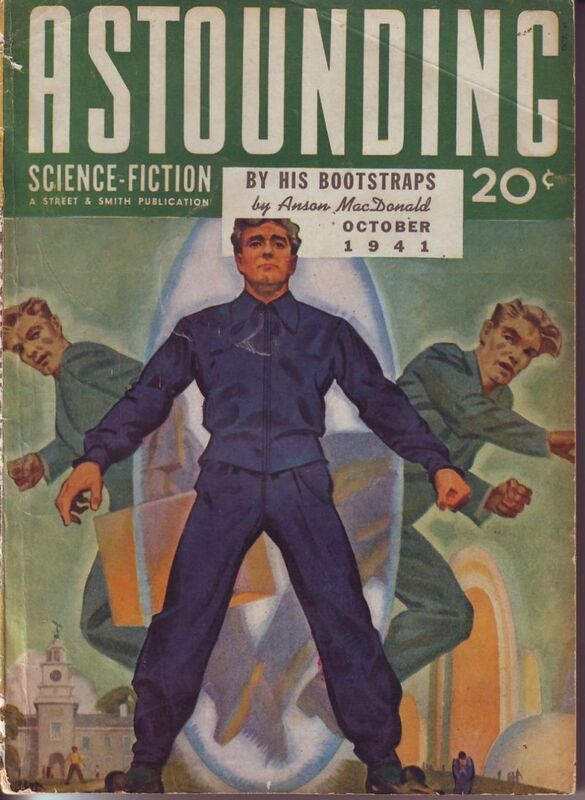 Here we have "Anson MacDonald" with Goldfish Bowl; the issue also has stories by Asimov and Lester del Rey. Part one of "Beyond this Horizon" by "Anson MacDonald". The second and final part of "Beyond This Horizon". Heinlein also has a book review under his own name; he did a couple more during the war but I don't have those issues yet. More importantly, this one features a little story by Issac Asimov simply titled "Foundation". And here we have the last "Anson MacDonald" story. Campbell had mentioned both writers... Heinlein and MacDonald... were busy with the war effort, and wouldn't be contributing much if any new material until that was resolved. And here "John Riverside", another single-use pseudonym, gives us "The Unpleasant Profession of Jonathan Hoag". I'm guessing the name was used since Campbell was out of material from Heinlein and MacDonald. 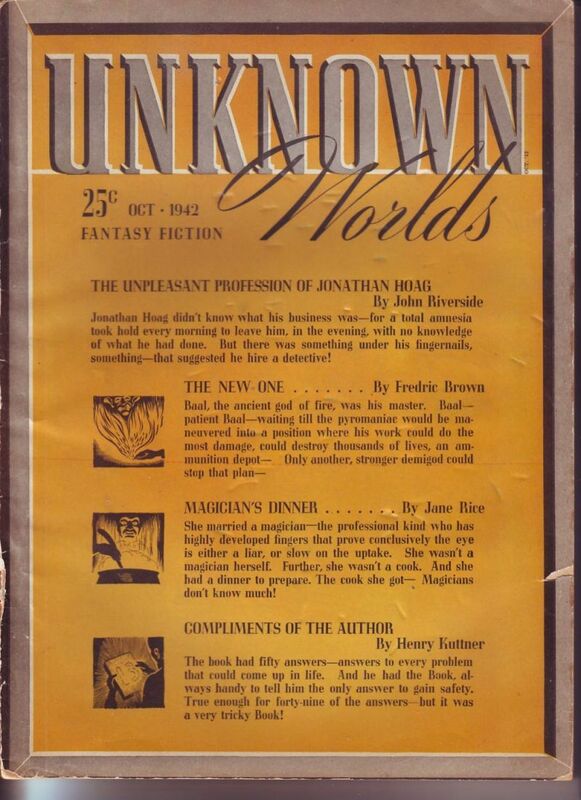 This one, in addition to the cover authors, has stories by Hannes Bok and Malcolm Jameson, a good issue to end this little run through Heinlein's pre-war writing. I hope people have enjoyed this little display of books, I for one find it very interesting to see how stories we later see in collections originally actually appeared. A few of the goodies I got today a the LA paperback show, always a fun time. Also here's a wood Gold Medal book rack that was at the show. 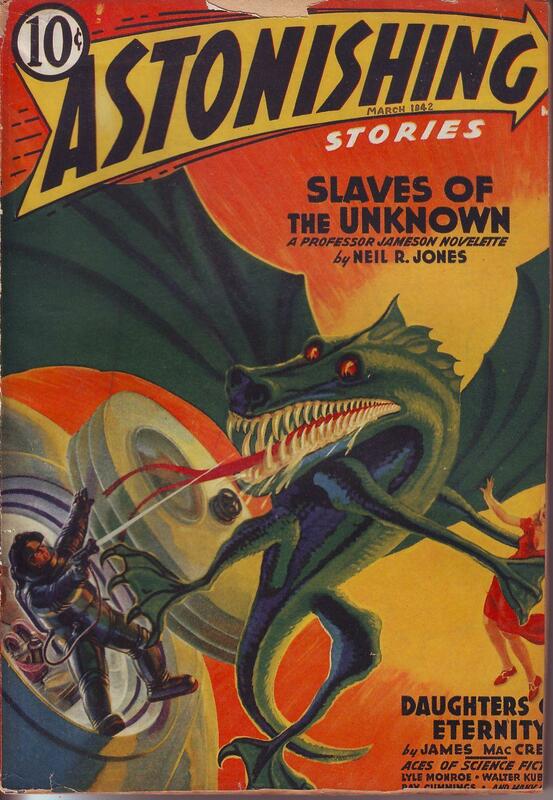 Astoundings had such restrained covers (compared to most other science fiction pulps). I always wondered what people who bought these at the newsstand felt - were they embarrassed to even buy these pulps? Did "regular" people think Astounding and their ilk were for 13 year olds, essentially? I'm guessing Astounding's restrained covers were to make older fans feel a little less awkward buying/reading these. I think it was not so much people were embarrassed as Campbell was trying to make them look more respectable to the people who wouldn't normally look at them in the first place. There was also an almost epic gap in quality between Astounding and everything else in the early years of the golden age, in any case. 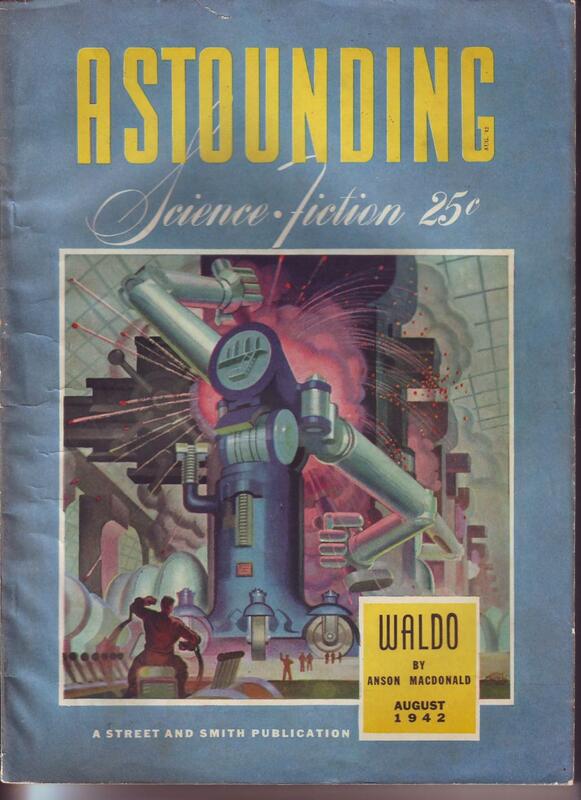 There were tons of exceptions on both sides, but there are probably twice as many classic stories in Astounding in the 40's as in every other SF pulp from the decade put together. 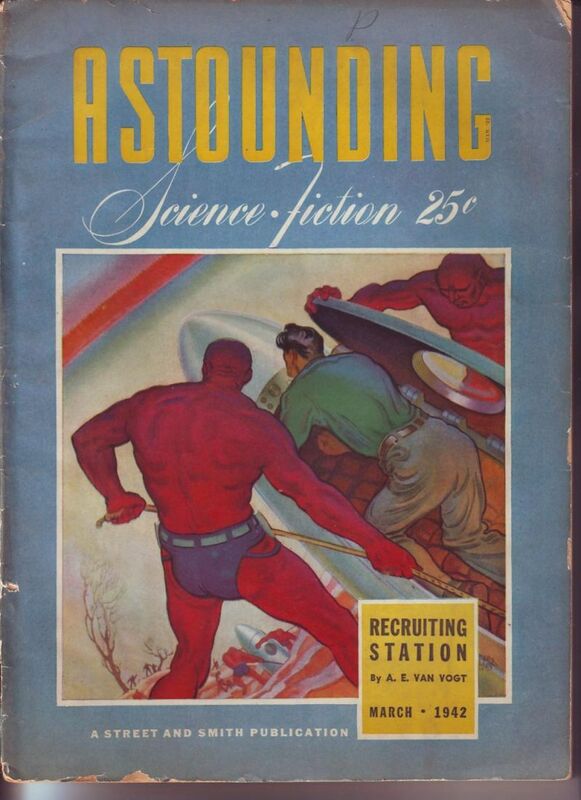 So Astounding was the "thinking man's sci-fi pulp" - science fiction you could proudly bring home to your mom and your teacher - nothing like those trashy Planet or Thrilling Wonder pulps! But... then who did buy Planet's with the BEMs and platinum-bra damsels?